Before I get chastised for writing a C*&^%$£~s post in October the organised amongst you will be beginning to prep for festive baking time. While Stir-up Sunday, when you traditionally make Christmas Pudding, isn’t until 20thNovember, now is the time to start on the cake to give it sufficient feeding time. A Christmas Cake that hasn’t been stuffed to the gills with alcohol is deemed as substandard in this house. This is the recipe I’ve used for years, and after many request to stop keeping the recipe close to my chest here it is. It’s from a 2005 edition of Prima magazine and produces a lovely moist fruit cake. The first and possibly most important part of a Christmas Cake is the soaking of the fruit at the beginning. Personally I think it works best with alcohol like sherry, brandy or whisky. Given I’m banned from Hubs’ whisky collection after last year’s expensive whisky Christmas Pudding incident I decided to use sloe gin as we seem to have quite a few forgotten vintages hiding under the stairs. As we struggle to eat a normal sized Christmas Cake betweeen the 2 of us, Pen reminded me that cakes can be cooked in small baked bean tins. As an avid fan of baked beans (look they are a good source of fibre and one of your 5-a-day) I knew it would be easy to amass the tins. To add a bit of variety I also picked up some tins whose contents I hadn’t eaten since I was about, ooh, 9 years old. Alphabetti Spaghetti, Spaghetti Hoops, BBQ beans and *whispers* beans with mini sausages. The things I do for my art. Many tins will do. I’ve been told pineapple rings tins also work well. Just don’t use tins that have contained fish. You may regret it. Remember this is essentially lots of dried fruit and nuts bound together with a small amount of flour and egg and consequently takes a great deal longer to cook than conventional cakes. Times can also vary significantly from oven to oven. The only true way to know they are baked is to insert a skewer in to the middle of the cake. Only when it comes out clean is the cake cooked. 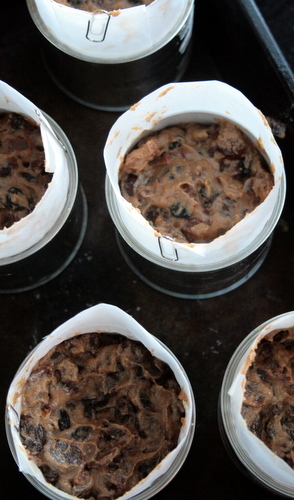 This is why fruit cakes are often double wrapped to allow them to cook properly. It is important to do this if you want a decent cake. If you want to see how to properly line cake tins look here where I have written an information sheet. Just don’t underestimate how long it can take to line 12 mini tins. Put it this way, it took me an hour just to line and fill 6 tins. There is an ulterior motive for me making the cakes now. I’m intending on decorating each of the cakes using a different method because I’m teaching an evening class in cake decorating in December. It also means they can be given away as gifts. During the following months I will post more blogs showing the different decorating techniques. 1) Put cherries and other dried fruits plus zest in bowl and soak in sherry overnight. 2) Line a tall cake tin: Lightly grease base and sides. 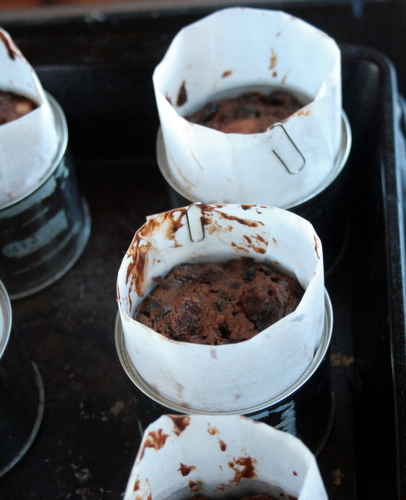 Line sides with a double thickness of baking parchment that stands 5cm above tin. Make 1 cm cuts at base to help it lie flat. Line base with double layer of parchment. Look here for more detailed instructions. 3) Preheat oven to 150°c. Whisk butter and sugar for 5 min till light and fluffy. Whisk in eggs slowly. When almost added, whisk in some flour to stop it curdling. Fold in flour, fruit and almonds. Spoon into lined tin and make a small dip in the middle of the mixture. Wrap tin in a double thickness of brown paper (or parchment) and tie with piece of string. Cook for 60-90 minutes. If you want the top of the cake to brown a bit more untie the string, so the top of paper is open, for the last quarter an hour. 4) Once cooked, poke lots of holes in the top of the cake with a skewer and drizzle remaining sherry over it. Don’t overfeed it or the cake will go too soggy. Leave to cool in tin. Then remove from tin, remove paper and wrap well in a clean lot of a double layer of greaseproof paper and foil. If you want to you can feed it every week or so with sherry before decorating to keep the cake moist. Posted on October 28, 2011, in baking, British, Cake, celebrations, Christmas and tagged Cake, Christmas, mini cakes. Bookmark the permalink. 26 Comments. What a great idea! Hardly anyone eats Christmas cake in my family…except my Dad who is constantly on a diet and really shouldn’t (! ), so this looks perfect. Love the idea of different decorations for each one too. I love these cute little cakes! I’ve been searching for a recipe for mini Christmas cakes as I was hoping to bake and decorate some as Christmas presents! Thank you for the inspiration! This is such a great idea, had never thought of making baby cakes for Christmas. But I’m thinking of doing it now! Looking forward to seeing your decorating ideas. They look so cute in their bean tins! Definitely not too early to start preparing for Christmas, I’m embracing it early this year! These look SO cute. I wasn’t going to make Christmas Cakes as I am not find of them but these are pretty tempting. They would make lovely presents too. Am I going to convert you to Christmas Cakes too? This is such a cute idea! I love it!!! 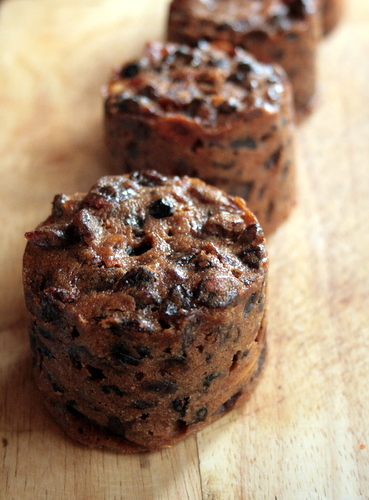 Hi Jules, I’ve just posted details of your mini Christmas cakes on my Stir up Sunday post. I’ve put appropriate links so hope it was ok to you use your mouthwatering cake picture (since I won’t be making mine for a few more weeks). Thanks for the inspiration. Yes that’s fine. I hope your cakes that you make go well. We have been using this method at the school I work for 8 years or so to enable 60 + Year 6 children to make an individual Christmas cake to take home as a gift at the end of term. It always works out well and, once decorated, the children love the result. I agree wholeheartedly with the time taken to prepare the amount of tins as they are rather fiddly – but the result is well worth the effort! I think bigger cake tins are easier to line than smaller, but still they are fabulous cakes for children to make. So far I’ve marzipaned 4 of the cakes ready to use in a demo next week. Fab!! I’ve got neighbours who want me to bake for them, and wondered how to adjust quantities for small cakes – this is brilliant! I would never have thought of baked bean tins – I’d probably have spent unnecessary money on little tins. However, George & I can eat our way through a big Chrissy cake all on our own – Blush! My cake of choice in the Christmas season in Stollen. I could also quite happily eat my way through a Christmas pudding in one sitting! Hi Anna, the tins measure approximately 75mm in diameter 55mm in height. Hello! I made these last month and have just blogged them – no tasting has been done yet but they’re looking good! Thank you for the inspiration and the genius bean tin lining info sheet – I’ve linked to it from my post so other people can use it too, hope that’s ok! Hi, glad you liked them. Hopefully by the end of the week I will have posted pictures of the finished cakes.